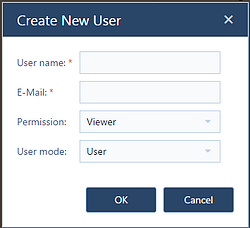 When you create new users, you have to specify their user modes and their user permissions. "Super admin": the owner of the account, being able to modify everything. "Admin": users who are allowed to add other users, and to change roles. "User": users without any admin right. "Planner": can use all functions, especially to make changes to the schedule. "Viewer": can only view the schedule and can neither make any changes to the schedule nor set shopfloor data. "Operator": can see and set the set shopfloor data within the Execute Mode. 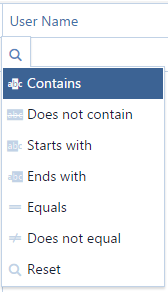 All other views, tabs and functions are disabled. Open the "Create Dialog" to add a user. Provide user name, E-mail, permission and user mode. New users will receive an email with some getting started information from us. Any field can be filtered by entering the criteria in the search field next to the magnifyer icon or point to the magnifyer icon without clicking to select from a list with relational operators. Edit the respective user's settings as described for the "Create Dialog". Moreover you can change the user's password. The account info area offers some statistics about your account. Click the respective buttons to contact us to upgrade your subscription and buy more tasks . The number of planners depends on the product plan (Basic, Pro, Enterprise) that you subscribe to. Contrary to this, you can add as many viewers and as many operators to your account - without having an impact on your monthly fees. We also allow any number of viewers and operators to log in simultaneously.